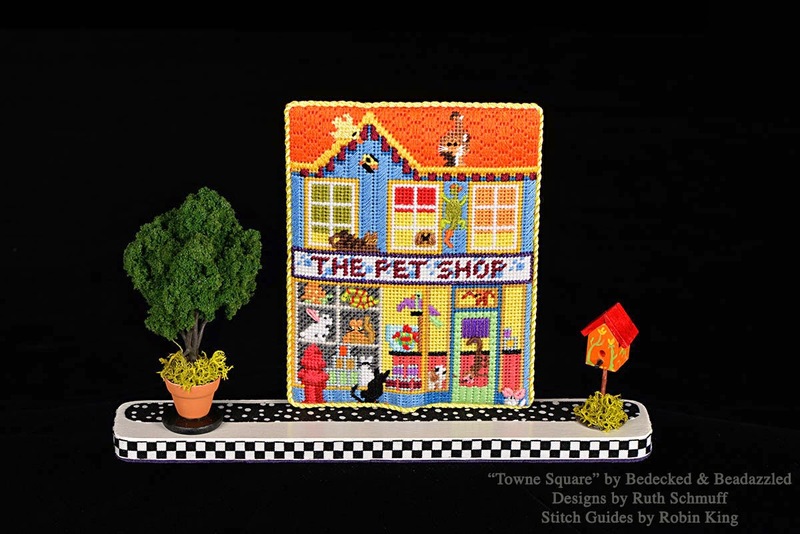 I'm back home from Michigan, and went directly into stitch guide writing mode. Sorry for being so quiet. I know that's not a good thing. 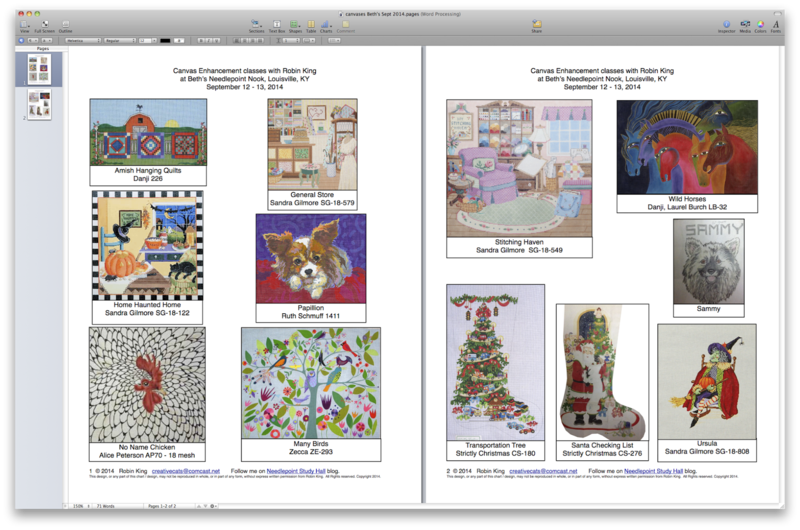 Here are the stitch guides for my next teaching event at Beth's Needlepoint Nook in Louisville, KY.
soon to become available... mid-September 2014. Look at the Amish Quilts and Wild Horses by Danji, 4 Sandra Gilmore canvases (a record! ), 2 Strictly Christmas stockings (another record! ), Puppy Dogs x2, Many Birds by Zecca, and No Name Chicken... oh, my! 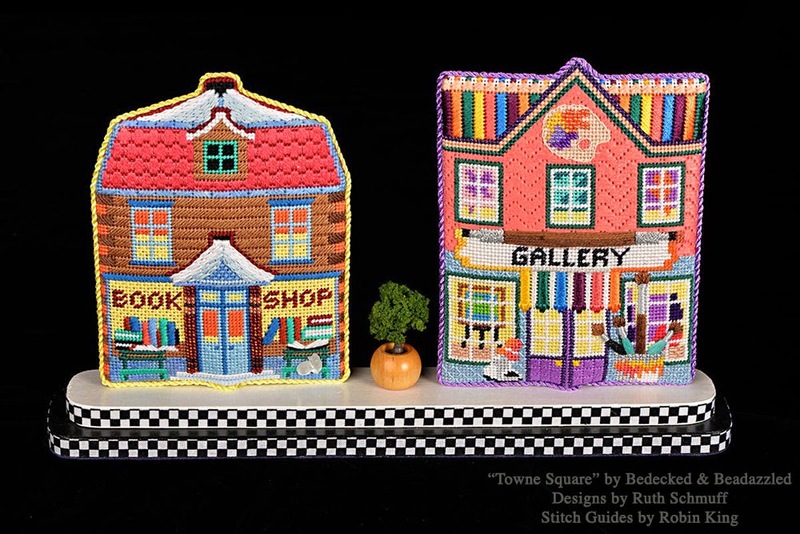 I do plan on writing a wonderful review of my time at Peacock Alley Needlepoint. We sure had fun. So until then... here's a stitch for you. Let me know where you see it being used. The "Cone of Silence" has been lifted. The models have been stitched. 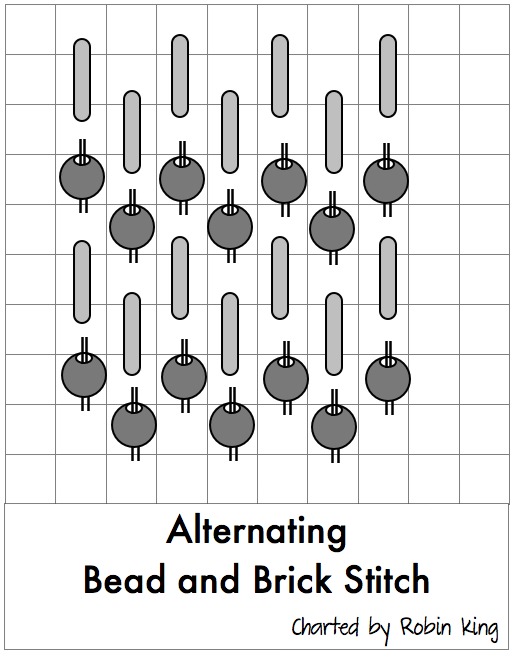 The stitch guides have been written. 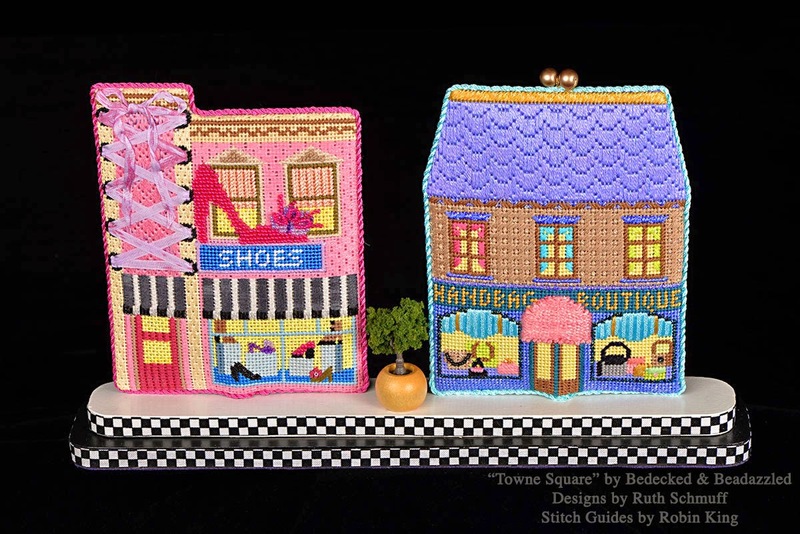 I am pleased to let the Blog readers know the Towne Square Club is ready for its reveal. 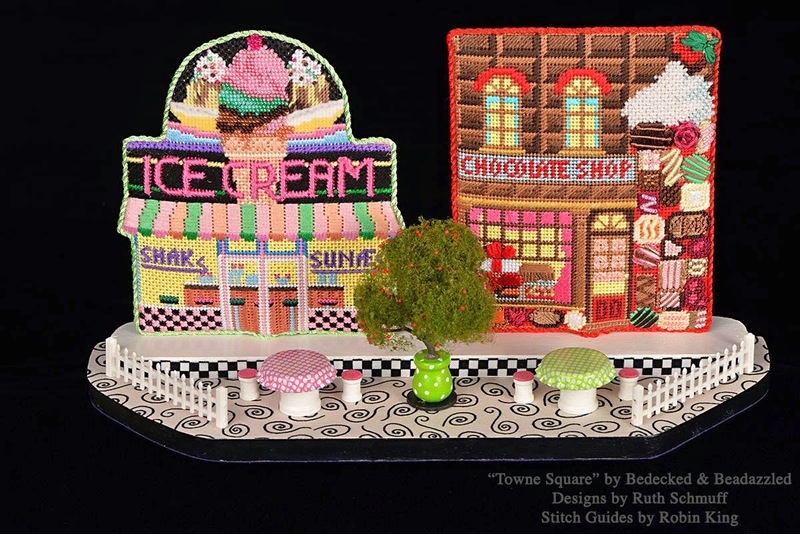 This is a collaborative effort by Ruth Schmuff from Bedecked & Beadazzled with stitch guides by Robin King. 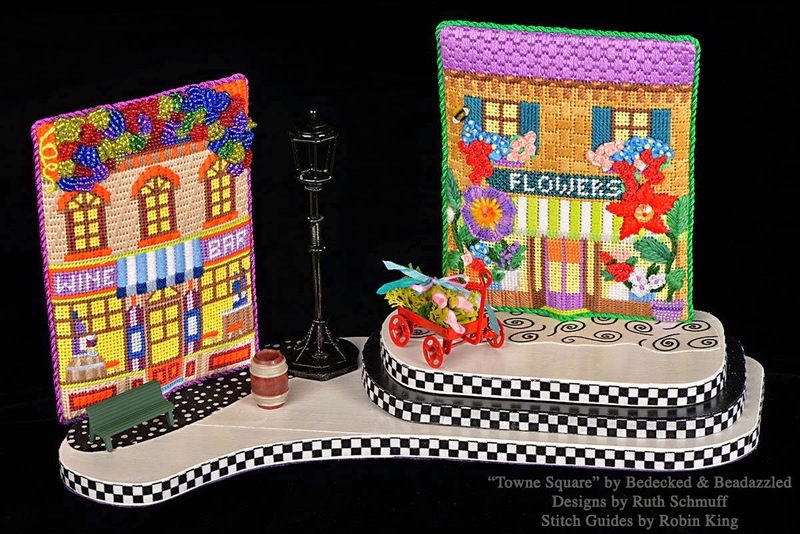 A long time ago... the youthful "Ruthie" asked Robin to stitch models and write the stitch guides for her latest project: a needlepoint village. Robin was honored to be asked, took on the task, and entered the "Cone of Silence." But then, Robin got busy. 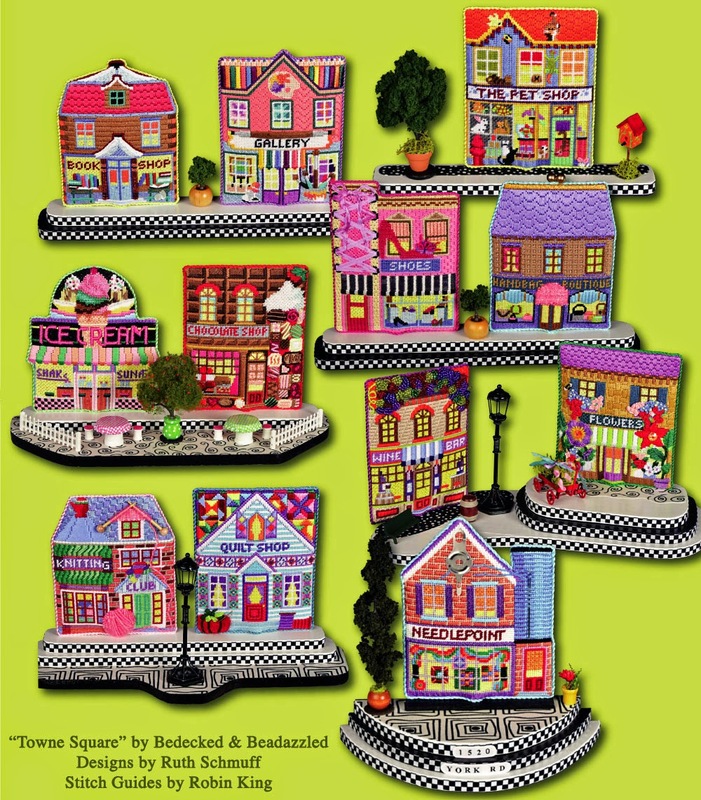 Her stitching on the village continued, but also taught at TNNA, edited/produced DVDs for Tony Minieri & Amy Bunger, began traveling and teaching at needlepoint stores, began writing stitch guides for customers, and tended to her cats. The months turned into years. Ruthie was very, very patient. Finally, the last stitch was made. The last word was typed. Robin stepped out of the "Cone of Silence." The Towne Square Club is ready. Here are some photos of the finished pieces as seen on Ruth's blog, It's not your Grandmother's Needlepoint along with her commentary... and some of mine. Love the tiny details. The roof on the book store is an open book. The gallery is lined with colored pencils. There is a shoe store and a handbag store. Note: the clever laces made from silk ribbon on the shoe store. The wine shop and the flower shop. You know we need a good bottle of wine, and flowers, beautiful flowers. Note: the grapes were so easy and 3D with "messy" beading. Ice cream and chocolate should be close at hand. 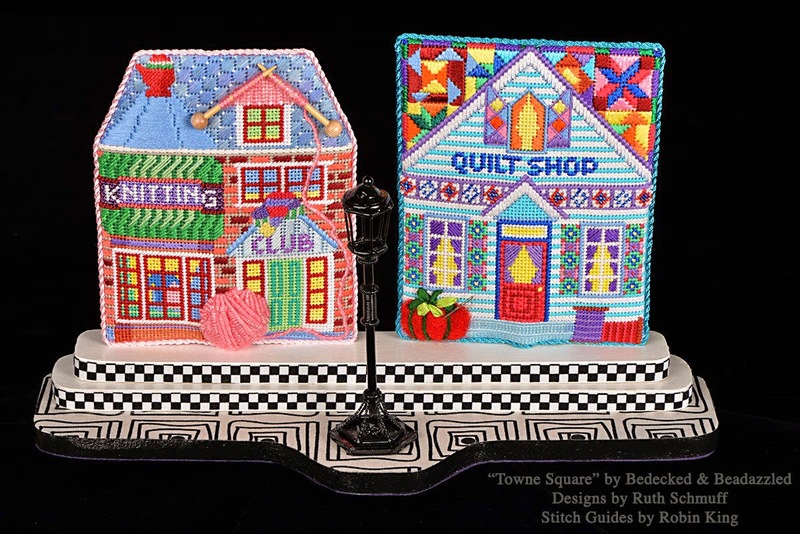 What about knitting and quilting, can't leave those out. Note: look at the real knitting needles. Also, the tomato pin cushion was felted. Of course, no home is complete without a pet; nor is an village. 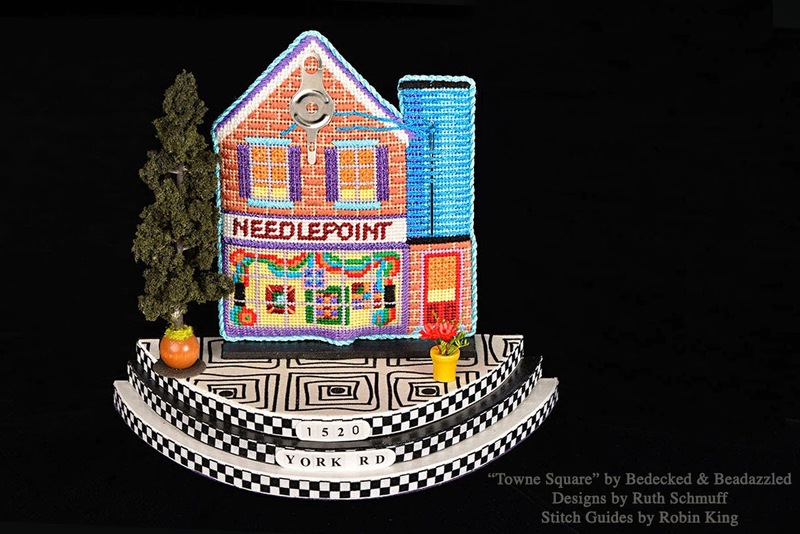 The needlepoint store is the heart of the village. Your address can be added here, too. The Towne Square Club begins shipping in October 2014. There are 12 shipments, and on the 6th and 12th months, you will get a second shop at half price. Give Ruth a call. Everyone loves to receive a package in the mail... especially from Bedecked & Beadazzled. Well, that's about it for now. Need to check on the other projects which need tending... and the cats, too.